I’ve been waiting to share these apps with you guys for a long time. Since February I’ve been enjoying a lot of great quality apps but I put off reviewing them as I only wanted to show them Nokia hardware (so Nokia users can see exactly if it will run and how it will perform). 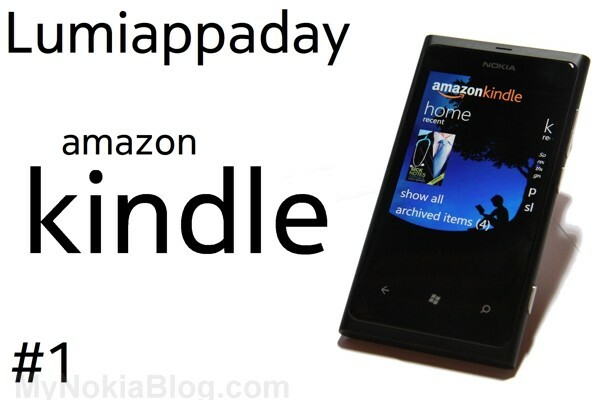 Since there are a lot of apps, I’m going to do a segment called Lumiappaday – where every day, we’ll be demoing at least one Windows Phone app for the Nokia Lumia. You may already be aware of these apps, you might not. There’s no particular order to what I’m showing. I’m really happy with WP Market Place as there’s always great quality apps to download. (Obviously Apple app store or Android Market is not possible on the Nokia Lumia handsets so there’s no point bringing that to the discussion). The first app I’ll show you is a demo of Amazon Kindle app. If you love reading books, you’ll love Amazon Kindle. Installing apps from market place. Just find the app through search, (maybe check out details/reviews/screenshots) and click install. You’ll be directed to your applist and see the application install bar. 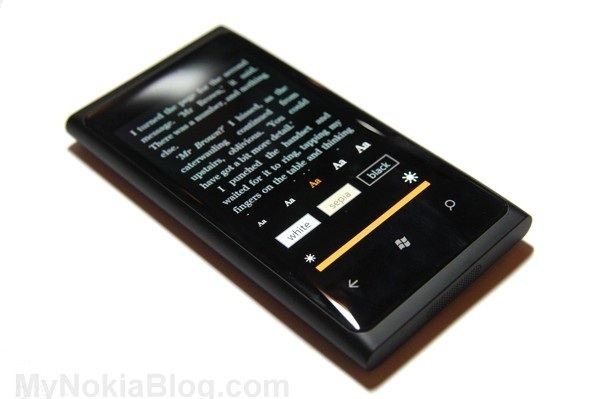 If you’ve used Kindle before, your books will be downloaded to archive. Once they’re there you don’t have to redownload them. You can buy books directly from the kindle bookshop. Classics are free. Where ever you access Kindle, it will sync up to where you last left. 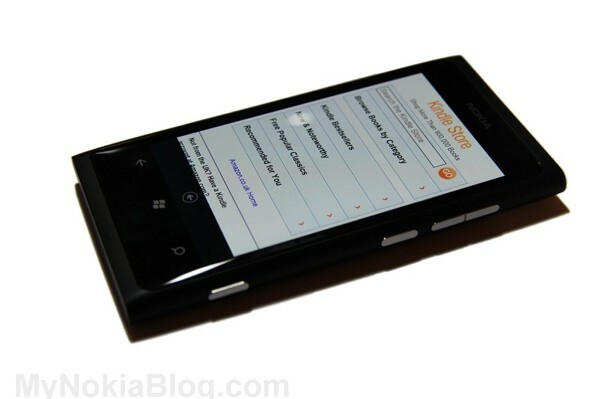 Panoramic UI blends into the Lumia 800’s curved edges. Tap in middle brings up options. You can change font size, screen brightness and the colour of the background (from white, to sepia, to a AMOLED-battery-friendly black). Read either in landscape or portrait. It rotates 270 degrees. You might have a problem reading portrait if lying sideways in bed.